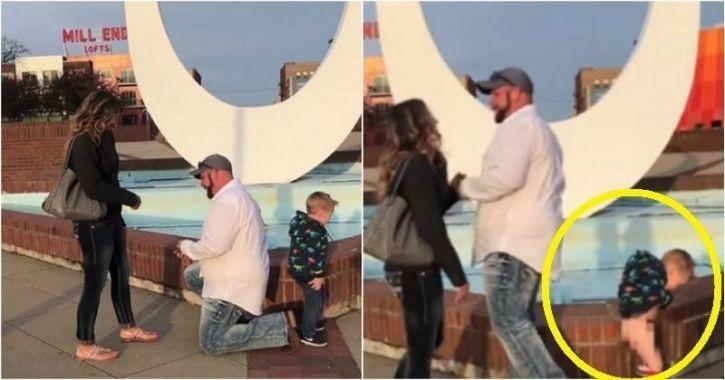 When Kevin Przytula proposed his partner Allyssa Anter on Saturday in Bay City. At that time his future son pulled his pants down and started peeing. When the 27-year-old mother was celebrating her happiness, her own child, Owen took away all the attention. At the point when the couple shared their valuable time online, their loved ones were more interested by watching Owen stealing the show. “Oh my God, he’s peeing, are you serious?” Kevin said, snickering, reports LadBible. “He pees outside at home, sometimes in the yard and we went and got ice cream the other day and he did it in the parking lot there,” Allyssa said. This video has more than 50,000 views online.